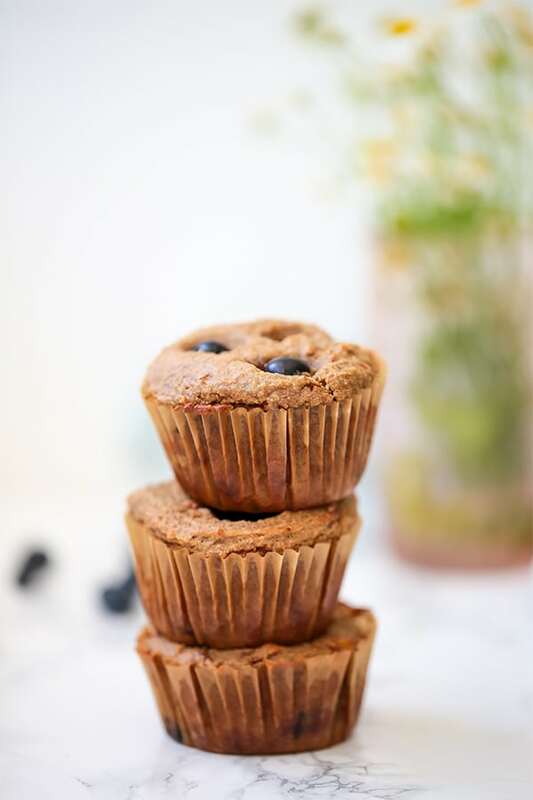 These blueberry banana muffins are a delicious treat with a protein boost! 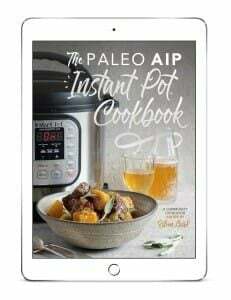 They’re paleo, AIP, totally grain and gluten free, and even egg free. Recently, I’ve been cravings muffins! They’re one of my favorite springtime treats as they’re such a perfect baked good to go with blueberries. I realized that I didn’t have a single muffin recipe on my blog, nor have I ever really tried to make one. How the heck would I make a muffin that’s grain free, dairy free, and egg free? It wasn’t an easy task, but it can be done, and these blueberry banana muffins were so worth the effort! 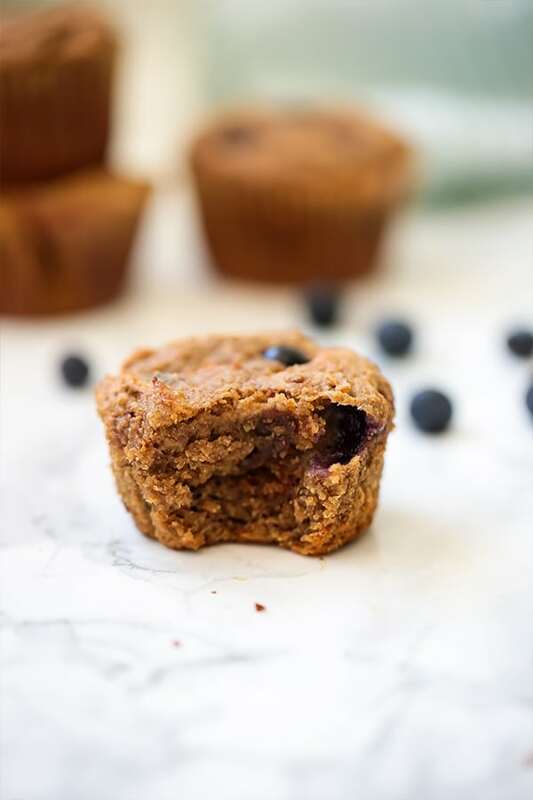 Not only are these muffins absolutely delicious, but they’re packed with real food ingredients, healthy fats, and even a protein boost from collagen peptides. They’re the perfect snack and treat that actually keep you satiated. The texture is light, fluffy, and so close to regular muffins that you’ll barely be able to notice the difference. My husband couldn’t believe that these were grain free, and egg free! Tigernut flour is one of my favorites for grain free baking. It’s nut free (tigernut is a tuber, not a nut) and it yields a great texture in these muffins when combined with plantain and banana. Coconut flour helps the stability of these muffins by absorbing any excess liquid to keep them from getting too soft. Green plantains can be found in many health food stores, and because they’re not fully ripe, they’re far less sugary. Just one banana for the whole batch of muffins leaves these muffins tasting like straight up banana bread. Yum! Coconut sugar helps the overall texture, color, and flavor of the muffins, and coconut oil adds healthy fats as well. 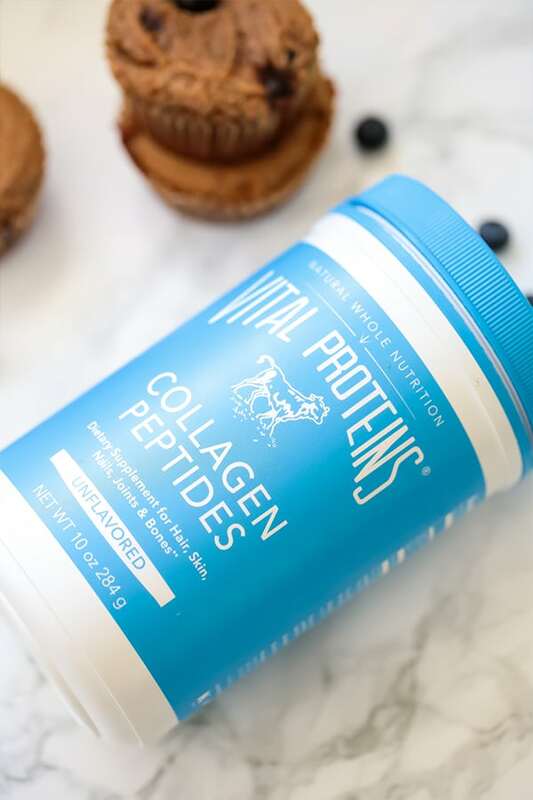 I’ve been using Vital Proteins Collagen Peptides for years, and I never let myself run out! Not only is it an amazing protein boost to make things like baked goods, energy balls, and smoothies, but it’s amazing for supporting the skin, hair, nails, and gut health. 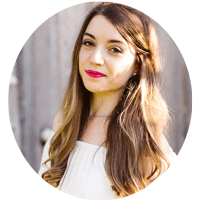 I notice a significant difference in my overall satiety, and my even my gut health when I use this collagen regularly. 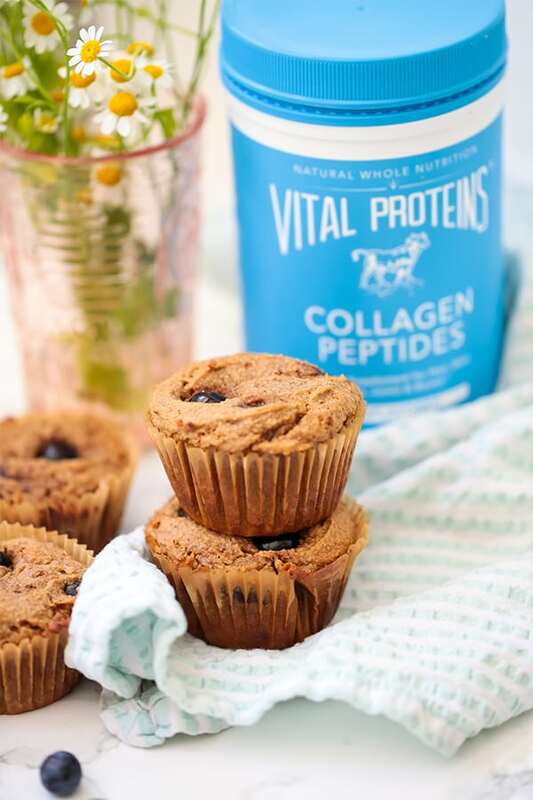 The collagen is tasteless and virtually disappears in baked goods which is what makes it so amazing for adding a protein boost to muffins like this! As these muffins are egg free, I’m using the Vital Proteins gelatin powder to make a gelatin egg as the substitute. I use gelatin eggs in the majority of my baked good recipes, and gelatin carries the same benefits for supporting the skin, hair, nails, and gut lining as collagen does. For someone who can’t tolerate eggs but loves to bake, this gelatin is an absolute lifesaver! If you do tolerate eggs, you can sub one regular egg for the gelatin egg and still get the benefits from the collagen in this recipe. Preheat the oven to 375 F and line a 6 muffin tin spaces with muffin liners. Combine the tigernut flour, collagen, coconut flour, coconut sugar, cinnamon, and baking soda in a large bowl and set aside. Using a blender, blend the green plantain and banana very well until completely smooth and no large chunks remain. Mix in the pureed plantain and banana with the flour mixture, stir in the melted coconut oil and set aside. For the gelatin egg, add the water to a small sauce pot and slowly pour over the gelatin. Allow it to bloom over 2-3 minutes until the mixture hardens. Place the pot on the stove and turn in on low heat. Slowly melt the the gelatin over 1-2 minute and remove from heat. Vigorously whisk the gelatin egg until it becomes frothy. Add the gelatin egg to the mixture immediately, and mix together. Stir in the blueberries. Spoon the batter into the muffin tins (the batter will be fairly sticky) and use a spoon to smooth down the tops of the muffins. Bake in the oven for 18-20 minutes or until baked through. Allow to cool on a cooling rack for 15 minutes before enjoying. Hi Nat. The muffins really need plantains to hold together and stay fluffy… I tried without and the texture wasn’t as good. You can find plantains at stores like Whole Foods, ALDI, and Latin American stores like Fiesta. Could something other than tigernut flour be used? Almond flour may be a good substitute, but tigernut works best for this particular recipe.